Earlier today I was engaged in a short discussion on twitter with @mguhlin and @cbell619 about disk optimization in Mac OS X. I recall back in late 2003 when I was supporting a few hundred Macbooks, defragging disks was not something I usually concerned myself with. But if you’ve had your Mac a while and it’s running slow (like my sisters) you should follow the optimization directions in the post. Of course it didn’t hurt that the systems I had were re-imaged every summer which generally resets the clock on disk crud build up. That’s one nice thing about using imaging tools to manage large deployments. You’re probably asking, isn’t the title of this post Windows 7 Disk Defrag? Why yes. So after the twitter back and forth, I got curious about something and hopped on my recently purchased and setup eeebox Windows 7 system that I am using to front end my home Drobo (a more versatile Drobo Share, you might say) and checked the disk defrag status. Low and behold a scheduled task list came up instead. Odd, I thought, since I had not scheduled anything of the sort. Not like the old days when you had to create a .cmd file to run defrag.exe and manually set it to run via the Scheduler. Nope. 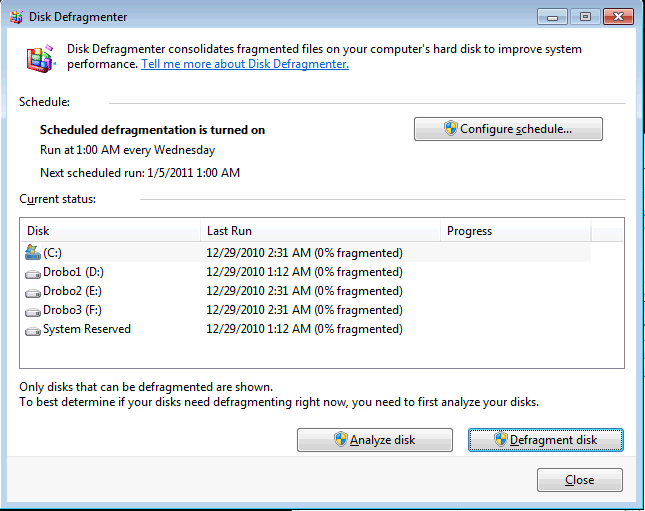 Apparently Windows 7 automatically schedules defragging for you. It was even nice enough to schedule itself to defrag my three 2TB Drobo volumes. Nooooo! Needless to say, I turned it off on the drobo volumes. I had noticed some slow disk access while using the system. I am not sure if this was the cause or if the little eeebox is just slow. Time will tell. I know Windows needs to be defragged every now and again but I prefer to use the contig tool from Microsoft (formerly sysinternals) to do my defragging in Windows. I front end it with the free GUI Power Defragmenter utility to keep it simple. This is a good bit of information to know as I look forward to my School’s Windows 7 deployment next summer. Or maybe we’ll just go Mac and not have to worry about defragging disks at all. Howdy! How does GUI Power Defragmenter compare to MyDefrag, the solution I use reglarly? ← Videos, Scripts and Teleprompters – Oh My!